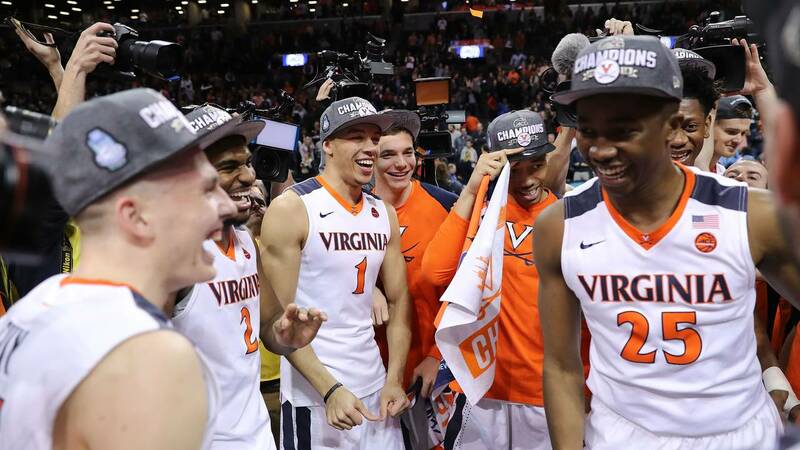 The Virginia Cavaliers, who beat North Carolina to win the ACC title Saturday, is the No. 1 overall seed in this year's NCAA tournament. Virginia, Villanova, Kansas and Xavier have earned the No. 1 seeds in the NCAA men's basketball tournament. The entire 68-team bracket was revealed with a live Selection Sunday TV special on TBS. The "First Four" play-in games will take place Tuesday and Wednesday in Dayton, Ohio. The first round will begin at several regional sites on Thursday. By the time next Sunday is over, the field will already be reduced to the Sweet 16. To see the entire bracket, visit NCAA.com. The tournament field is a mix of at-large teams, which are picked by the NCAA selection committee, and automatic bids, which are teams that won their conference tournaments. The 2018 NCAA men's Final Four will be March 31 at the Alamodome in San Antonio, Texas. The national championship game is April 2. The women's NCAA tournament 64-team field will be announced Monday at 7 p.m. ET on ESPN. That championship game will be April 1 at Nationwide Arena in Columbus.